One-and-a-half-story building, originally built as a gas station, and now a produce stand. Brick with asphalt shingle roof. Steeply pitched front and side gables. Projecting front gable forms entry portico which served to cover area for pumping gas. Original wing to west, filled in with brick at what was probably the service garage. Front door and windows original. Small one-story wing added to east, and a covered drive-through for the current use added to original west wing. Stylistic elements suggest that this may have been an early Pure Oil Station. 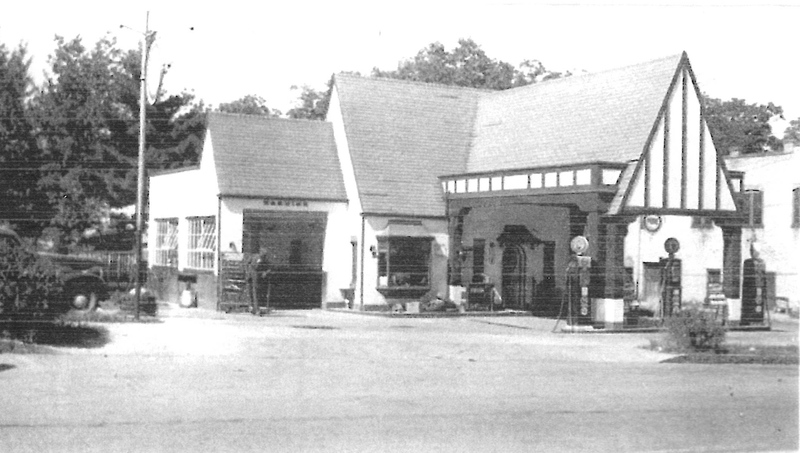 Building Plaque reads: Built in the "English Cottage" style by the Pure Oil Company, this building served as Bella Dura Pure Oil Service Station and later Fisher's Purol Station. From 1965 to 1995, it was the Chicken Shack restaurant operated by Clifton Shipman. The building later served as a bus station. Prior to this building, the Mountain City Inn, later called the Dotson Boarding House, stood here.